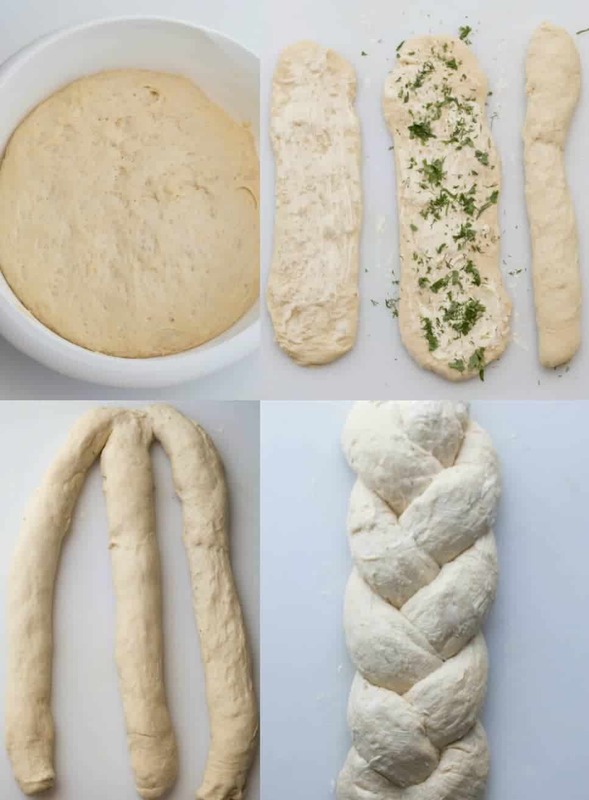 Great recipe for Braided Bread with a butter and herbs filling. This easy bread recipe is a keeper. 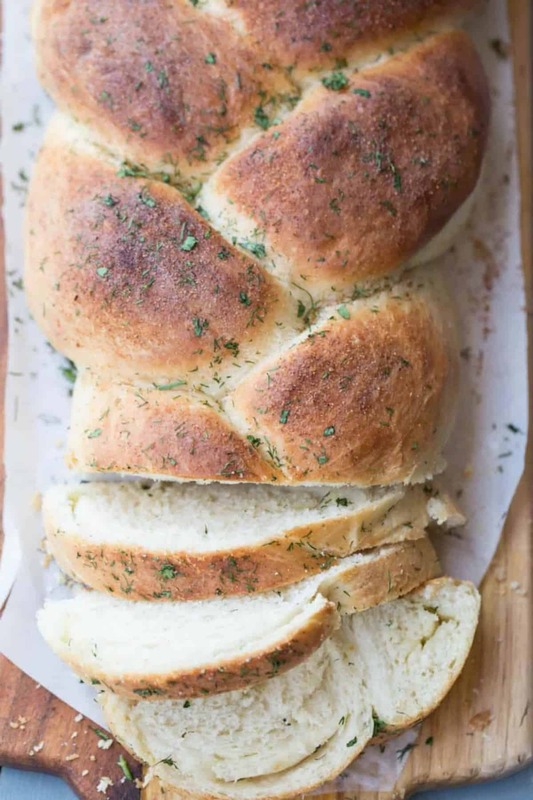 A soft bread loaf with a surprise touch of herbs and butter and a garlic butter crust. This braided loaf is going to be a beautiful loaf for when you are serving guests or family. PIN this to your Bread Board HERE! Don’t feel intimidated by making a homemade braided bread loaf. It truly is easy and not much can go wrong during the preparation or baking process. Prepare the bread dough and allow to rise. Once bread rises, divide into three equal parts. Generously spread butter and top with herbs, roll back tightly. Loosely braid the three strands. 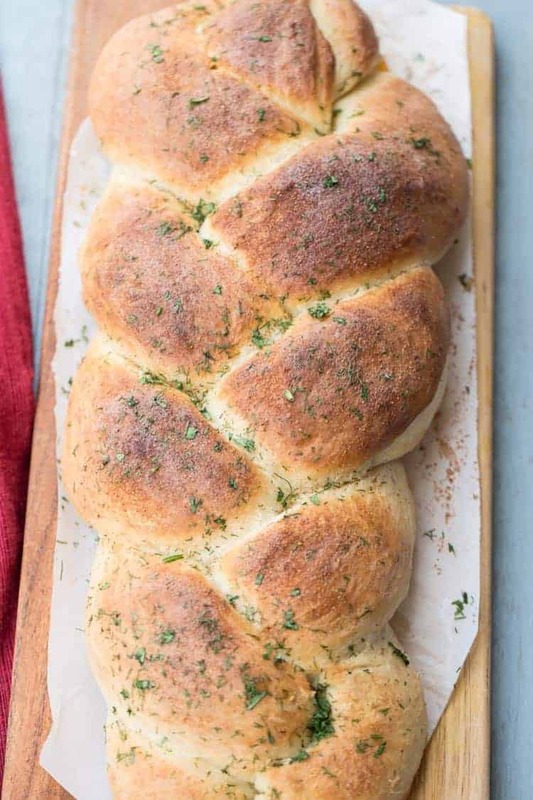 Allow braided loaf to rise, brush top with butter and garlic. What kind of herbs should be used? You can use any combination of herbs you like. Dill with cilantro, or dill with parsley or even all three. Whatever you have on hand. How to mix the dough? Tools used to make this recipe: rolling pin, pastry brush, baking sheet. 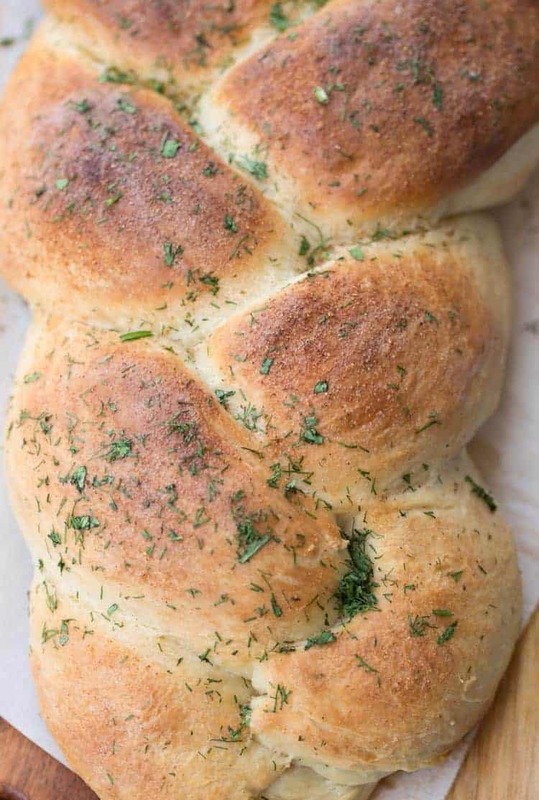 Homemade recipe for soft and buttery braided bread with herbs and a garlic crust. Sift flour into a large bowl. In the center of the flour create a well (pushing flour to the sides). In a saucepan, combine the water, milk, and 2 Tbsp butter. Heat until very warm. Pour into the center of the flour. Add salt to water, lightly stir. Sprinkle yeast over water and sprinkle sugar over yeast. Let the yeast active and become foamy (about 3-5 minutes). In a small bowl, whisk the egg. Once yeast is foamy, add the egg to the water and whisk until egg is incorporated. With your hand, slowly start adding flour to the water as you continue mixing. Mix until dough is lumpy. Transfer dough onto surface. Knead 4-6 minutes until dough is smooth and flour is well combined. Lightly grease a bowl with baking spray or butter. Place dough into the bowl. Cover bowl with plastic wrap and a kitchen towel to keep the dough warm. Let the dough rise 1 hour, or until the dough doubles in size. Gently, divide dough into three equal parts. Roll out each part into about 3” x 12” sizes. It’s easiest to roll out by starting with both hands in the middle of the rope, then pull to sides as you roll. Repeat until all parts are the same in size. Generously spread butter between three parts. Add herbs and roll tightly. Braid strands, pinching and tucking ends under braid. Once braided, stretch the middle out gently. Brush top of braid with butter and cover loosely with plastic wrap (I like to lightly spray the plastic wrap with cooking spray so it doesn’t stick to the dough as it’s removed.) Let the braid rise another 30-45 minutes, the braid will almost double in size. Sprinkle garlic powder over top of the braid. Bake braid 25-30 minutes, until golden brown. Once bread lightly cools, brush with remaining butter. Cool bread completely before slicing. Add any remaining herbs on top of braid for extra appeal, optional. GETTING TO KNOW YOU: What’s your favorite kind of homemade bread? Share in the comments below. Can I use this recipe on the dough cycle of my bread machin? I have a bad arm and it is very hard for me to knead my dough. This recipe is one I have been looking for as my son just loves the herbs and garlic on it. Yes, Dea. That would be just fine. You can also use a Kitchen Aid mixer if you have one. My mom has a bad arm too and she’s gotten used to using a Kitchen Aid mixer. 🙂 Enjoy. It’s a lovely recipe. Love this bread recipe. The herbs in it adds such a great taste.